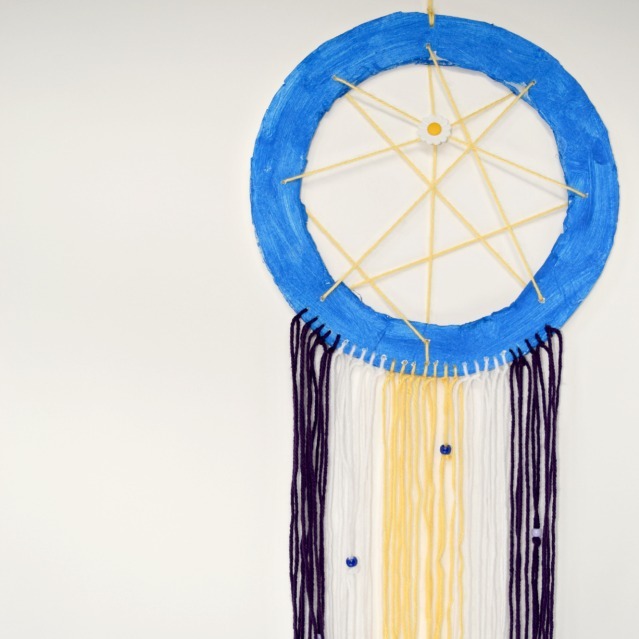 Last week, I shared a dream catcher I made for a friend and the little one was very curious about them. A couple of craft supplies and a Native American lesson later, the little one is sporting her very own dream catcher above her bed. 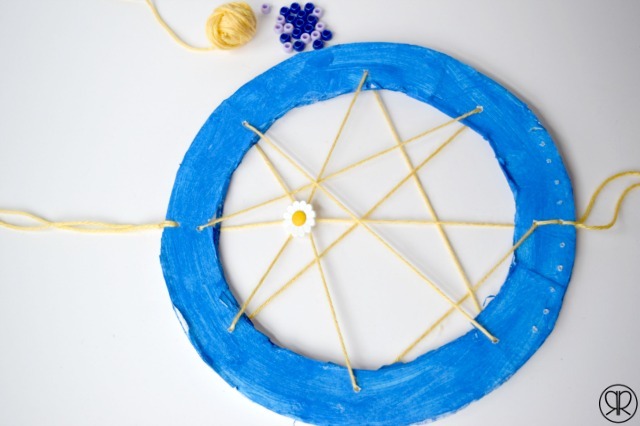 Join us for some fun making our newest kid’s craft: a dream catcher. 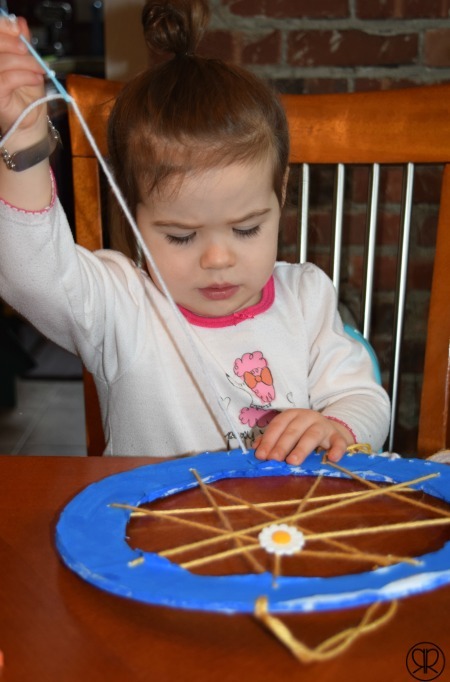 After making a gift for a friend, Elise was very curious in dream catchers. When I asked her what she thought they did, she said, “I think they are a special place for me to keep all my happy thoughts.” Adorable, right? Elise became excited to make her own but it was nearing her bedtime, so I pulled out some yarn and a couple of pipe cleaners. She wanted a bigger one, so I set up this big dream catcher craft for the next morning. 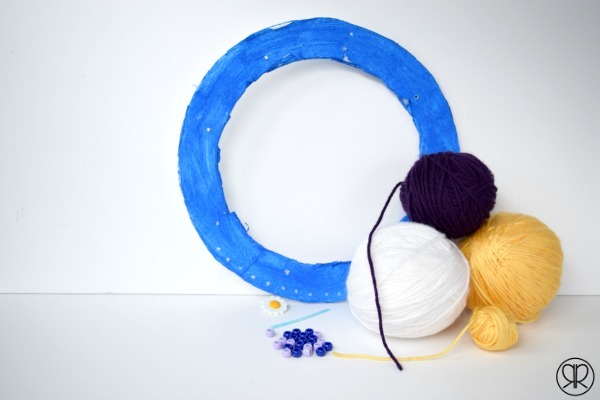 foam core circle – You could use a paper plate here with the middle cut out, but I didn’t think of that until after this was started. Duh. I cut out a form from a piece of extra foam core and Elise painted it blue with some washable paint. I punched a few holes in the ring, making sure to add a hole for hanging at the top and many holes at the bottom for the yarn strings to hang from. 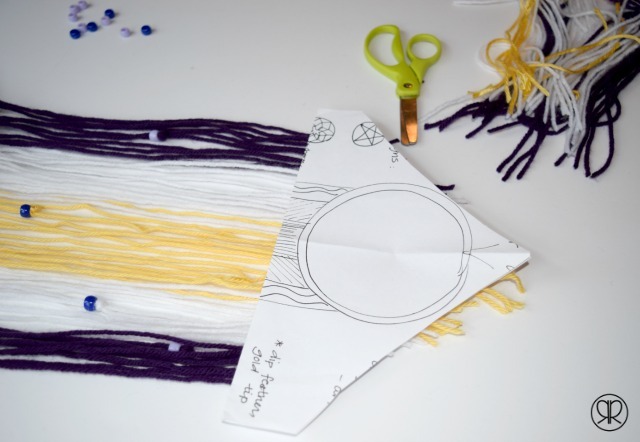 She chose a few colors of yarn and then she practiced her measuring and scissor skills by cutting lengths of about 36 inches (these will be used for the hanging strings at the bottom of the dream catcher). She then cut a 26 inch piece for weaving the ring. I got her a plastic needle from my stash – I have no idea what it’s called, maybe a yarn needle? 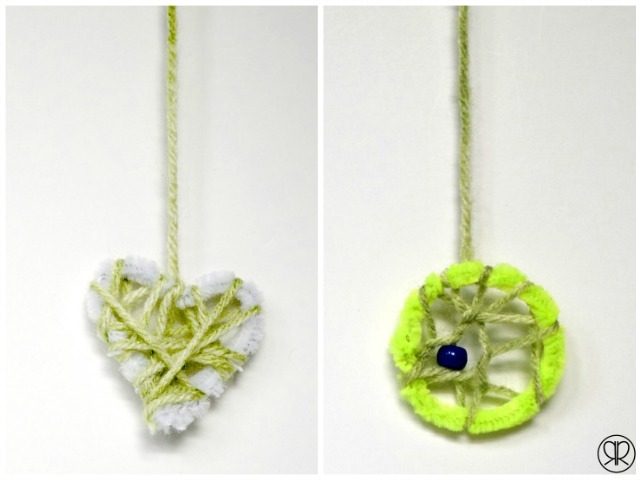 She needed help threading the needle, but she then started weaving it in and out of the holes. There were a couple of times where we had to back out a thread or two and she changed her mind a couple of times about where the daisy button should be, but after about 5 minutes, she was done. I tied the piece into a knot in the back. She started on the hanging pieces and even tried tying some knots. This is still an area she needs help with, so I did most of the tying after she threaded it through the hole using the needle. Elise got a little frustrated threading the beads (each bead on both the strings of yarn for a tie) for the hanging pieces, so when she asked for help, I gave it. When we were done, she thought it needed more yarn hanging down so I punched more holes – a lot more holes – along the bottom. After she was done threading the yarn and I was done tying it to the form, I made a template and asked her to cut along the bottom. It was a slow process, but she made it through, and honestly did better at following the template than I thought she would. She did cut the template a few times, so be sure to use something you don’t need (I used my notes from the dream catcher ornament I made). 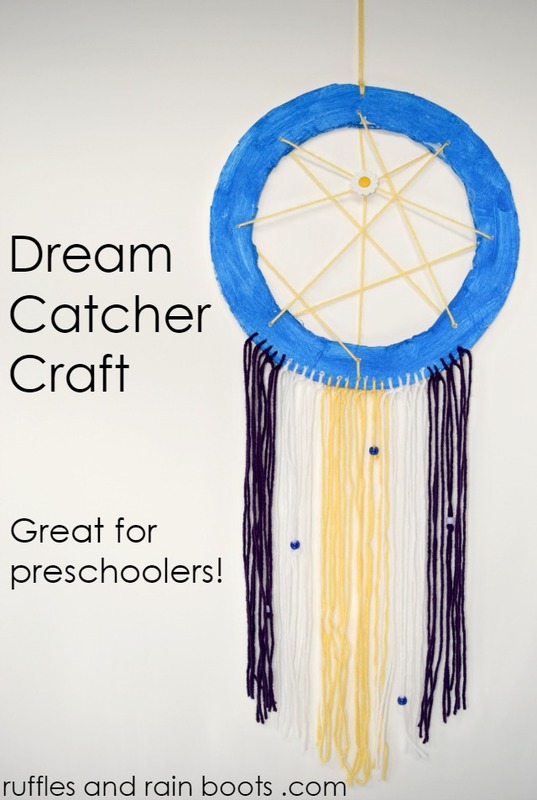 Elise is very proud of her dream catcher craft and I’m always looking to work on some fine motor activities, so we are considering this craft a ‘win.’ This activity will allow an older toddler or preschooler to work on lacing, measuring, and scissor skills in addition to their creativity. 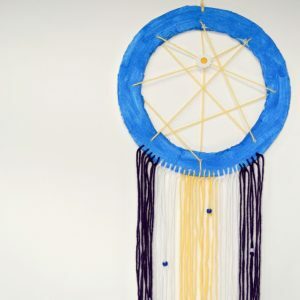 If you think others might find this project a fun way to practice these skills or help with scary dreams, would you perhaps share it to Facebook or Pinterest? I’ve always been intrigued by dream catchers after seeing that movie (you know the scary one). I would love to make my own and think this would be great for both me and my toddler to do. I just love your crafts and can’t wait to get this one done. Thank you.